Even though next year’s predicted solar maximum – the period of greatest activity in the sun’s 11-year cycle – is expected to be smaller than its predecessor a decade ago, the impact on society over the coming months could be worse than in the past. While our reliance on electric power is obvious, our reliance on radio communications may not be. By “radio communications” I don’t just mean walkie-talkies and two-way radios. Military organisations around the world, including Australia’s defence forces, heavily utilise ground-based radar surveillance for routine border protection, and have done so since the end of the second world war. 2) Satellite-transmitted radio signals are manipulated by the layer of partially ionised gas in Earth’s upper atmosphere – the ionosphere. Earth’s ionosphere is a dominant source of error in GPS positioning due to its effects on radio signals passing through the atmosphere. The commercial “SATNAVs”, and more recently smartphones, that people commonly use for navigation across town are accurate to within a few tens of metres, and therefore a drop in accuracy using these devices during geomagnetic storms may not be obvious. But industries that conduct high-precision (centimetre-level) positioning operations, such as surveying and exploration mining, are strongly impacted by space weather disturbances. 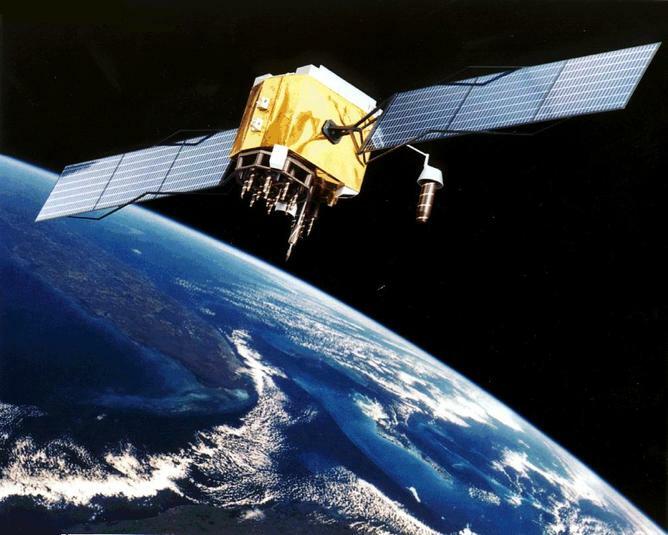 Artist’s interpretation of a GPS satellite. Many Australians would be unaware of how much our government departments and organisations rely on EOS in their day-to-day operations. The Federal Government spends about A$100 million per year on EOS data acquisition. This costs Australia an estimated A$100 million in the first year – the federal government’s entire yearly investment – with flow-on effects expected in subsequent years until replacements are launched. But one problem caused by this geomagnetic storm that was far less publicised at the time was that around 1,500 orbiting objects were completely lost by the North American Aerospace Defense Command (NORAD). The rest were operational satellites worth millions of dollars. One of the lost objects was later found to be orbiting at an altitude 30km lower than it was prior to the storm. It took NORAD more than seven days to find all of the objects again and to resume normal operations. Space weather prediction is a challenging task that a number of organisations around the world specialise in. Those organisations include, but are not limited to, the NOAA Space Weather Prediction Center in the USA, the Solar Influences Data Analysis Center in Belgium and the Australian Space Forecast Centre – the space weather branch within the Bureau of Meteorology. The importance of the work these organisations do is significantly increasing as we become more heavily reliant on technology into the future.